Heat oven to 375°F (350°F for dark or nonstick pans). Place paper baking cup in each of 24 regular-size muffin cups. Make and bake cake mix as directed on box for 24 cupcakes. Cool 10 minutes; remove from pan to cooling racks. Cool completely, about 30 minutes. Meanwhile, place 3/4 cup of the frosting in small bowl. Tint with red gel food color to desired shade of red. Place three-fourths of the remaining frosting in small bowl, and tint with yellow food color. Tint remaining frosting with blue food color. Frost cupcakes with red frosting. 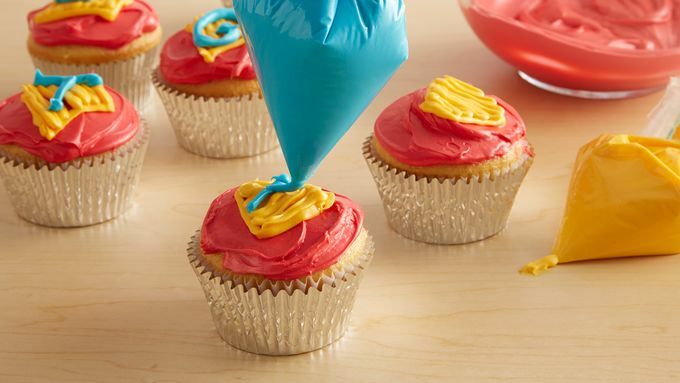 Place yellow frosting in resealable food-storage plastic bag. Cut off small corner of plastic bag, and pipe a diamond-shaped emblem on top of each cupcake. Place blue frosting in another resealable food-storage plastic bag. Cut off small corner of plastic bag, and pipe letter or number in center of each diamond shape. Use your favorite cake mix, such as chocolate or white, in place of the yellow cake mix. 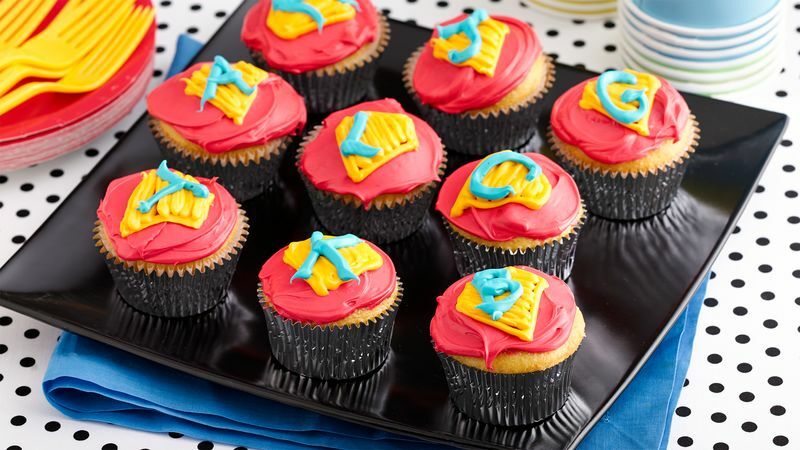 If desired, decorate some of the cupcakes with lightening-bolt shape instead of diamond-shaped superhero emblem.